Serious buyers and quality visitors were in abundance despite the poor weather that afflicted this year’s Singapore Yacht Show. A short spring break in the Mediterranean is always a good idea and, when the destination is Palma de Mallorca, it can be magical. All three Melges boats taking part in the Audi tron Sailing Series, sailing series organised by B.Plan Sport/Events, are now heading to Loano for the first racing acts starting on Friday 3rd April for three weekends in a row. With the massive increase of waterside developments and the rapid expansion of dive and water sports companies setting up in the region, the Middle East is increasing its popularity as a venue for marine-related leisure activities, according to experts. The 2015 edition of the Monaco Yacht Show will underline the beginning of a new cycle as the show will celebrate its 25th edition, but above all because it will display a new look with extra berths and a reorganisation of its exhibition area. 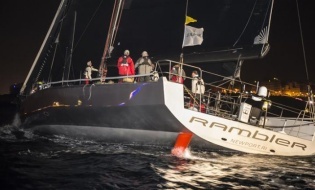 Rolex Middle Sea Race "Rambler on the Charge"